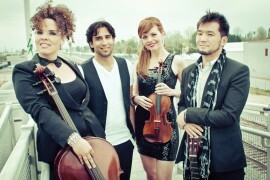 2013 Latin Grammy Nominee for Best New Artist, Quattro is a fresh, new and innovative ensemble that blends Latin POP. JaZZ and ClassICAL Crossover – “POPZZICAL” The best way to experience Quattro is to See and Hear them on stage. Only then will you feel the passion and energy that is overtaking every listener of their music. Quattro is raising the bar of originality with fresh contemporary composing and arranging that “pays homage to the classics” and forges a new contemporary sound. The music is composed and/or arranged by group members: Giovanna Clayton (cello and vocals), Lisa Dondlinger (violin and vocals), Kay-Ta Matsuno (guitar and vocals), and Jorge Villanueva (percussion and vocals).